I have not been able to fish for some time due to an ever encroaching career as a Music teacher and with the winter term being one of the busiest and most stressful, I have been desperate for a moment of serenity at the waterside. Even with this craving driving me to set the alarm for the crack of dawn on the day of my only opportunity for a lay in, it was still a struggle to motivate myself to get up and scrape the remnants of the second frost of the season from my windscreen. Once on the footpath to the Great Stour however I was pleased to be there admiring the autumnal colours which still adorned the surrounding trees. 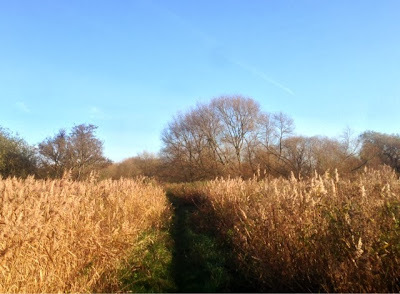 A few minutes later came a rude wake up call as the footpath, which was more than just a little overgrown and ambiguous at best, vanished and I found myself all of a sudden up to my knees in ice-cold water! My boots were full and trousers clinging to my legs catching every slight gust of wind to make me bitterly aware of the seasons character. Several swims along this stretch I had passed as they clearly could not be accessed without taking a swim but now I was invincible, no more harm could be done and so I waded through flooded marshland to a prime spot. As you might have guessed, I was fishing for pike and started out fishing a mackerel, caught whilst fishing this summer with my wife at Reculver, presented on a float/ ledger paternoster rig with a 2 foot rotten bottom. No sooner had I cast and set the rod down then the familiar chirp of my bite alarm insisted that I picked the rod straight back up again to receive my first pike of the day, a jack of around 5lb. As soon as this fish was returned I repeated the process exactly. It was like deja vu. 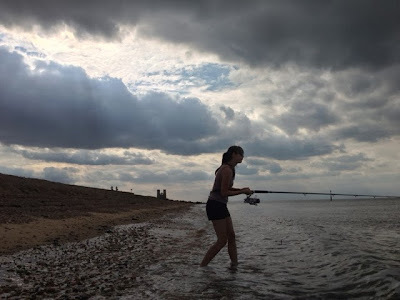 My wife fishing at Reculver helping me catch the bait for todays trip! 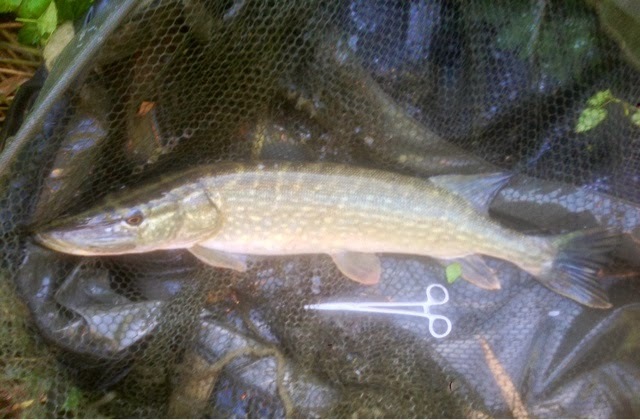 The first pike of the session. I didn't photograph the second pike as it was identical - it may actually have been the same fish! Having only brought 2 mackerel with me my bait was now spent and so turned my attention to spinning. 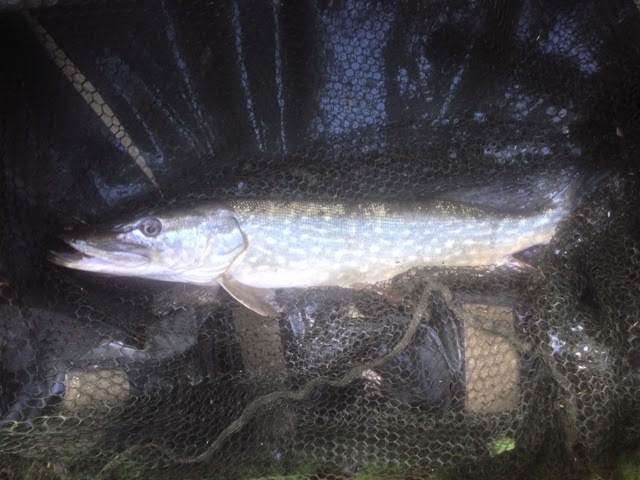 I have not been pike fishing for long and so had never caught a pike on a spoon or lure before having had all my success so far on dead baits. I've been doing some dep' work for a local funk/ soul band and with the proceeds have bought myself a new spinning rod- it's made by Sonik, is 9 foot and casts up to 40 grams and like anyone with 'new toy syndrome' was keen to play with it! 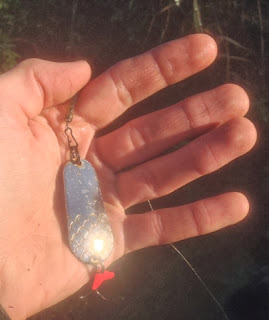 The spoon that caught the mackerel and the pike! I used a simple silver spoon and cast to features down stream, practicing different rhythms on the retrieve to make the inanimate piece of metal better resemble a living fish. I was delighted when after a long time casting and catching no more than passing pieces of debris, a slightly larger and infinitely angrier pike charged away ripping braid off the spool at a rate of knots having snatched my spoon as it approached the near margin. The rod action was beautiful with more than enough power in the lower blank transferring seamlessly to a joyfully sensitive tip. I cannot put the sensation of the fight on this rod into words! My first ever pike on a spoon. I did not weigh it but would guess somewhere around 8lb. So what is the moral of the story? I've certainly learnt to look where I'm going and not to take terra firma for granted. What else? The notion 'nothing ventured, nothing gained' has been reaffirmed as has the idea of perseverance paying off. Whilst my trips seem to be few and far between at the moment I am happy to be making the most of them and enjoying every moment.